Psst…Could You Give A Speech, Right Now? Rodney, it looks like Dori isn’t going to make it today. Yeah, I don’t see her. She was one of our speakers. So, do you have a speech you can share with us to fill in? It’s my own fault. I’ve been attending Toastmasters for over a year. I attended because I love to talk. And I always over prepare. They say to always come with a speech ready. And I did. Anytime someone wasn’t available, I had a speech ready. . .except today. I’m working on some speeches that are supposed to be 15-20 minutes long so they take more preparation. But, my club was used to being able to call on me last minute. Now Jane was staring at me not so much with a questioning look, but a look of “Tell me the name of your speech.” It didn’t help that the meeting had already started. Ah. . . I . . um. . .Oh wait! I have this speech that I wrote for the scary story contest. But, I haven’t really practiced it. The reason I hadn’t presented this story at the Hauntings contest was that I didn’t feel I was ready. Now, I had maybe 15 minutes to prepare. The speech was about 10 minutes long. Fortunately, I had it typed out with all of my edits hand written in. I started reading through it. 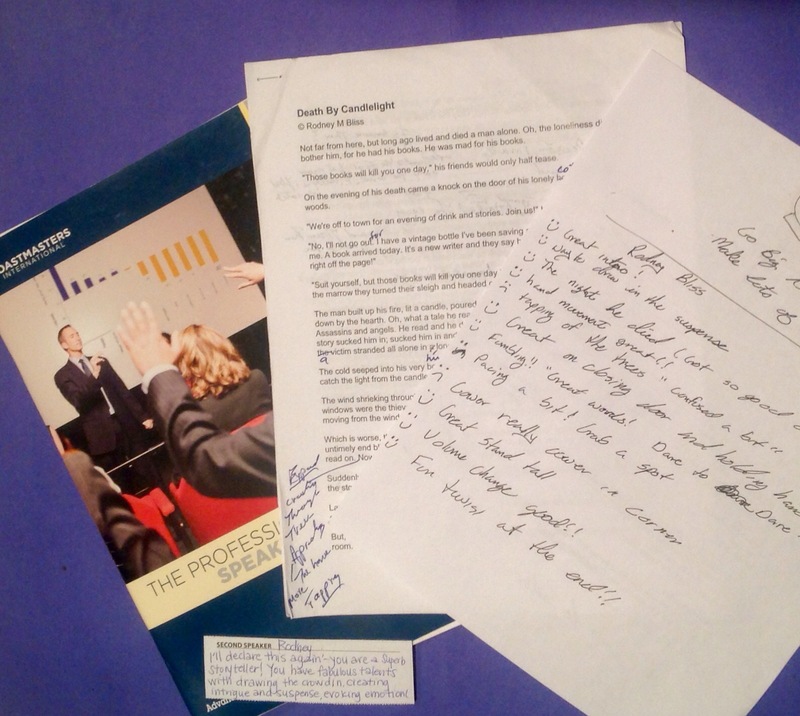 There are several elements that go into a successful speech. The first, of course is content. I had to make sure I knew the content. Second, at least in Toastmasters is memorization, no notes. I paid particular attention to the transitions. Knowing that after I say THIS phrase, I need to pause and then say THAT phrase. Third, is voice, inflection, tone, volume, etc. I was going to have to figure out most of that during the speech and hope I got it right the first time. And finally, for this speech, I needed to set up a scene; a fireplace over there, a door here, a window over here. The objects weren’t there, of course. But, I had to convince the audience they were. Blocking is the process of walking through a scene to get the movements right. Blocking was another piece I was going to have to do live. The first speaker got up to tell what turned out to be a fascinating speech on how to recognize and avoid abuse. I had to keep reminding myself to read my story not look at Martha. And our next presenter will be Rodney telling us a scary Halloween story. I took my paper with me and put it on the podium just for moral support. How long is your story, Rodney? Ah. . .let’s say 8-10. But, really it’s going to be as long as it takes me to tell the story. I hadn’t even been through it with a stop watch. I wasn’t sure how long it was. I love storytelling. Since this was a story I had written myself, I “knew” the essence of the story. I got the hook set in the opening. I pulled the crowd with me into the little cottage nestled in the snowy woods. I conjured up a storm that blew through the top floor of the old American Fork city hall that we meet in. The conflict built along with the suspense. Just at the climax the timers green light came on telling me that I had 2 minutes left. Perfect! Right on track. I brought my protagonist to the final conflict and the crowd came with me. I never hear the applause, so I can’t tell you how much they applauded, but the comments were all very positive. I thought about the fact that when we act a particular way, people come to expect us to act that way. I’m in the middle of a crazy project at work. It’s got an incredibly tight schedule. But, then every time they hand us a project it has a crazy tight schedule. And every time we pull it off. So, management has come to expect that we will be able to pull together a 3 month project in 2 months. I’ve talked with my technical team about it. We need to adopt the attitude that Mr. Scott from Star Trek has. We should tell them it’s going to take 5x as long as it actually takes and then we look like heroes for finishing early. Yeah, that never worked for us either. But, as I once again had a story that I could pull out at the last minute, I realized there are worse traits to have than to be counted as dependable. I just have to prep another speech before my next meeting. Fortunately I’ll miss the next couple so I’ve got a little time. Always have a story ready, even if in your job “story” means being able to complete an extra project. Look for my story “Death By Candlelight” on Halloween.